Illegal timber treaters are becoming increasingly blatant and fearless, even advertising their poles on social media, as the authorities continue to fail to take action against them. This booming trade is causing substantial damage to the legal timber industry, which can ill afford the loss of sales in current times. 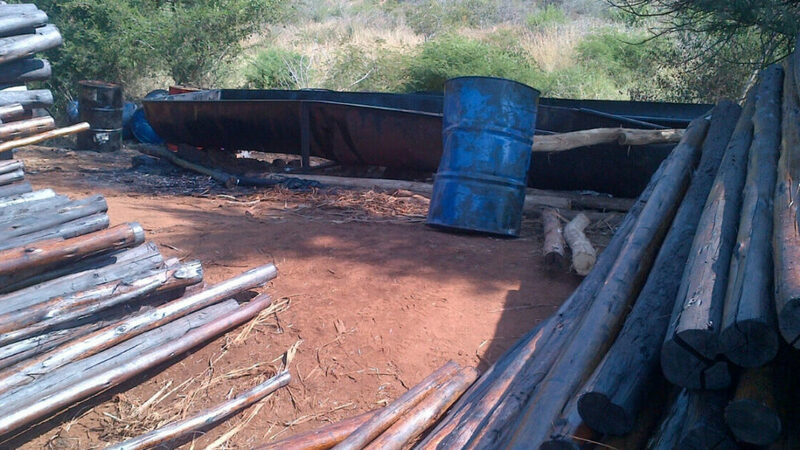 Illegal treatment “hotspots” are the KwaZulu-Natal Midlands and other areas of the province, parts of Limpopo, and the Eastern Cape, although there is inadequate reporting from this last province, explained Bruce Breedt, Executive Director of the South African Wood Preservers Association (SAWPA). In both KZN and Limpopo, on almost every street in small rural and even some larger towns, illegally treated poles can be seen for sale at informal hardware depots. “Illegal traders are also now starting to surface in Mpumalanga, where in the past it was never regarded as a problem,” Bruce said. “SAWPA keeps a record of every illegal operator we know of and reports them all to the National Regulator for Compulsory Specifications (NRCS). “Rural people, some of whom use the poles for building shacks, are paying almost the same for these poles as for properly treated poles, but illegally treated poles are sure to fail,” said Bruce. Punitive measures are weak: Illegal traders are simply warned and not properly sanctioned, and neither is their sub-standard timber confiscated. It is suspected that a large part of the timber is usually stolen, and in some instances, stolen creosote and CCA is used to treat the timber. This is usually supplied, in very small quantities at a time, by operators, Bruce said. However, illegal treaters also phone suppliers and SAWPA members, trying to buy the preservative, and use any method of turning timber green or black, including paint colourants, carbolineum and old car oil if they are not able to get their hands on controlled preservatives. SAWPA has advertised on local radio stations, alerting the public; has developed brochures in English and indigenous languages that explains the difference between illegal and legally treated timber, and is in the process of investigating the possibilities of infomercials for its members to distribute. When the NRCS visits illegal traders, telling them to halt operations, they simply move to a different location, and continue, since most of them do not make use of industrial equipment, but merely dip or brush paint their substances onto the poles to give them the impression of a treated pole. Punitive measures are weak: Illegal traders are simply warned and not properly sanctioned, and neither is their sub-standard timber confiscated. The NRCS has stated that this commodity is the only one it is failing to monitor successfully, and that this is due to industry-specific challenges that come with the product. Unlike the cement industry, in which there are only a few major players, there are large numbers of small wood treaters, which contributes to the difficulty of enforcing regulations. SAWPA has raised the issue with several government departments, including the Department of Trade and Industry, to which the NRCS reports. At this meeting, Bruce provided a background on the scale of illegal trading and the lack of enforcement. The NRCS, which was present, said it would require collaboration from other government and regulatory institutions in order to act. Formal requests have been made to certain departments but as yet, nothing has been done to find a solution to the inept policing. In January, SAWPA met with the Department of Agriculture, Forestry and Fisheries (DAFF), and submitted a report the department had requested, to help the acting director-general understand the problem. “Now we’re waiting to see if DAFF can help,” said Bruce. “Dolphin Bay understands the threat and, as a result, does not supply CCA to any unregistered treatment plant,” says Bertus.